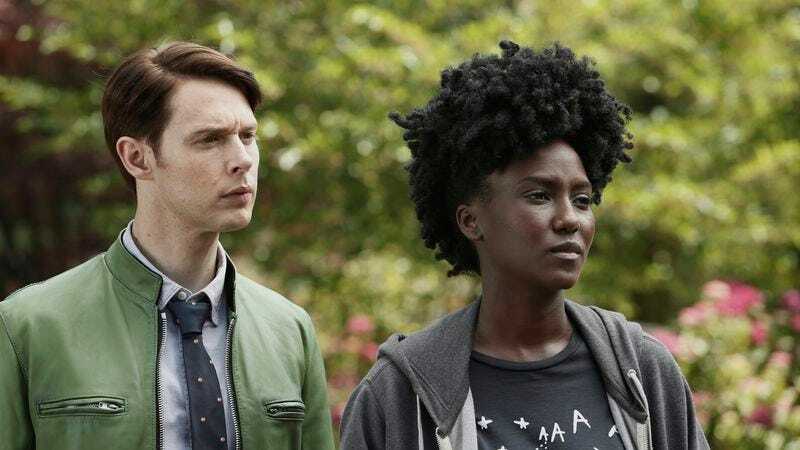 There are signs that for a show called Dirk Gently’s Holistic Detective Agency, the titular character is awfully ancillary to his own show. This whole episode was about things happening to people around him rather than to him, and it’s hard to point to specific events he has caused to happen, other than burning down a house. On a conceptual level, this isn’t a huge problem. Part of his whole ethos involves being in the right place at the right time until sufficient unconnected events happen that help him solve a mystery. But as a character in a TV show, he’s starting to seem about as useful to most scenes as a potted plant. He’s just there, contributing little beyond manic enthusiasm. This is most obvious in the attempted parallel between Ken and Todd, both of whom are suddenly swayed to believe that their strange new companion is telling the truth. But while Bart shows her prowess by taking out a contingent of armed men after a freak incident frees her from a trap, it’s hard to pinpoint what Dirk has done to earn Todd’s trust. Take the scenes at Patrick Spring’s house. The whole thing ends with Farah complimenting Dirk on his detective work, when she’s the one who receives a mysterious inheritance, figures out it’s a map, then leads them to the secret room. Sure, Dirk enters the time from the map in the lock and suggests that the “her” in the note they find is Lydia, but neither of those discoveries is exactly a sign of his amazing detection skills. In fact, he wouldn’t have even gotten to the secret room without Farah, since he doesn’t recognize that they’re looking at a map, and she’s the one who realizes there is a secret room. It’s literally a sequence where a black woman does everything and then gives all credit to a useless white man at the end. And once the dream team gathers at Todd’s apartment, Amanda, Farah, and Todd all come up with clues to move things forward. Dirk is just there, ready to go fetch his magic light bulb. He’s comic relief on his own show. The show is also struggling with what’s supposed to be comic, and what isn’t. Are we supposed to laugh at the scene of the two cops talking to Todd? There’s a sort of generalized anti-law enforcement bent on the show, but it’s hard to know how to read some of the scenes. It’s like the cops have to be willfully stupid in order to prove Dirk’s superior intellect. There’s nothing about Todd to suggest that he’s either an arsonist or a mass murderer, and yet the cops waste precious time trying to trick him into some kind of confession instead of asking anything useful, despite the fact that he’s come in voluntarily to try to help them. At least Amanda has been brought into the fold, though her lack of interest in what happened with the Rowdy Three is a little odd. They’re still an odd outlier on the show, though. Are they agents of chaos, neither good nor evil? And while we’re on confusing developments, why does the former rock star have completely different speech mannerisms when he’s in a new body? If he’s the same soul, wouldn’t he essentially be the same person in a new form? For now, these mysteries remain, as does whatever an “original soul” might be, to say nothing of the kitten, the dog, and the bald guys whose names rhyme with “Ed.” But at least we’ve got some kind of fancy steampunk machine to look forward to. What are the odds it’s a time machine? “Rogue wall enthusiasts,” also the name of the episode, is a very Douglas Adams sort of joke, and it feels telling that it felt so out of place when Dirk was babbling about it in this episode. That little look Amanda gave her brother when he said hi to Farah was cute. Is there a suggestion that she and Dirk are into each other? He’s kind of desexualized, but she seems to like him. “What the hell is a po-tah-to?” is a very valid question. “This doesn’t look anything like you. 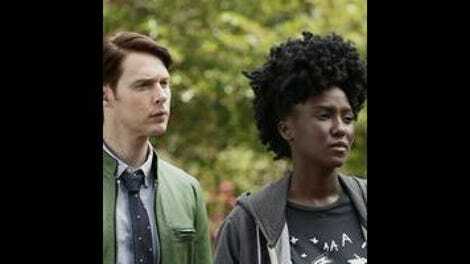 He’s got the hair all wrong.” Dirk Gently, art critic. The involvement of the very efficient Farah does suggest things are going to start cooking a little faster, doesn’t it? Also, she bounced back from her abduction and imprisonment pretty darn quickly. We’re all agreed on continuing to call him Chief Tyrol, right?